A fun and unique way to add a little color to your casual recreation or dining room is the Ride Ergo White Barstool. Offered in a variety of contemporary colors, shapes and sizes, each barstool features a gas lift mechanism that allows for the stool to rise and descend with the simple touch of a lever. 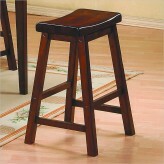 Furniture Nation is proud to offer the Ride Ergo White Barstool online. We serve customers across the DFW region including Weatherford, Irving, Richardson and many more. Ride Ergo White Barstool : L18" x D19" x H31.5 -"